You should be familiar with object-oriented programming using a programming language; however no Java knowledge is required. In this path you will learn the fundamentals of Java including objects, classes, and other programming commands. You will learn how to work with XML, Security, and JUnit. You will then explore enterprise topics such as Java Beans, Servlets and Java Server Pages (JSP). You will learn how to work with AJAX with Direct Web Remoting (DWR), DOJO, and JAX-WS (Java API XML Web Services). You will get an overview of RESTful Services and how it is applied with JAX-RS. You will learn about Injection, Sub Resources, Responses, Forms, and Exceptions. 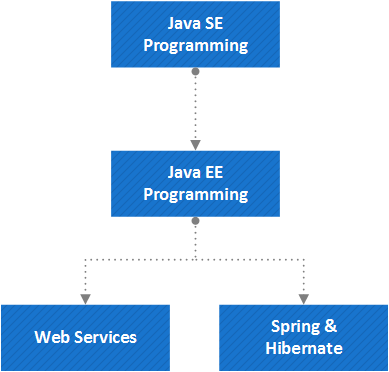 You will learn about Spring and Hibernate, and how to build enterprise Web applications that can be used to connect to SQL databases and data sources. Lastly you will take a look at Selenium for performing and automating web application testing.